Trovafloxacin is an antibiotic that was withdrawn from the market relatively soon after its release due to the risk of hepatotoxicity. Trovafloxacin is mainly metabolized to its acyl-glucuronide by uridine 5′-diphosphate (UDP)–glucuronosyltransferase (UGT) 1A1. In this study, we examined whether the acyl-glucuronide is involved in the development of hepatotoxicity. A UGT1A1-induced cell model was developed and the toxicity of trovafloxacin acyl-glucuronide was evaluated. The UGT1A1-induced cell model was developed by treating HepG2 cells with chrysin for 48 h. Chemokine (C-X-C motif) ligand 2, a cytokine involved in drug-induced liver injury, was uniquely induced by trovafloxacin in the UGT1A1-induced HepG2 cells. Induction of UGT1A1 resulted in a decrease in cell viability. An in vivo animal study further demonstrated the importance of UGT1A1 in the trovafloxacin-induced liver toxicity. Although the complete mechanism of trovafloxacin-induced liver injury is still unknown, trovafloxacin acyl-glucuronide can be involved in the development of toxic reactions in vitro and in vivo. Previously, we determined UGT1A1 as the main UGT isoform responsible for trovafloxacin acyl-glucuronidation.19) To investigate whether trovafloxacin acyl-glucuronide is involved in trovafloxacin-induced liver injury, in the present study, a UGT1A1-induced cell model was developed and the toxicity of trovafloxacin acyl-glucuronide was evaluated. We further employed Ugt1-knockout mice to examine the importance of trovafloxacin acyl-glucuronide in the trovafloxacin-induced liver injury in vivo. UDP-glucuronic acid (UDPGA), alamethicin, chrysin, estradiol, and estradiol 3-O-glucuronide were purchased from Sigma-Aldrich (St. Louis, MO, U.S.A.). Trovafloxacin was purchased from Wako Pure Chemical Industries, Ltd. (Osaka, Japan). Recombinant human tumor necrosis factor α (TNF-α) was purchased from Roche (Mannheim, Germany). Primers were commercially synthesized at Life Technologies (Carlsbad, CA, U.S.A.). All other chemicals and solvents were of analytical grade or the highest grade commercially available. The human hepatoma HepG2 cells were obtained from DS Pharma Biomedical Co., Ltd. (Osaka, Japan). HepG2 cells were grown in Dulbecco’s modified Eagle’s medium (DMEM) containing 100 U/mL penicillin, 100 µg/mL streptomycin, and 10% fetal bovine serum (FBS) and were maintained at 37°C in a humidified atmosphere containing 5% of CO2. Before the treatment, HepG2 cells were seeded into six-well plates at 5×105 cells/well. After 24 h, the culture medium was changed to a normal or a chrysin-containing DMEM medium and subsequently cells were maintained for 48 h until harvesting. RNA was isolated from the cells and was used for the quantitative-reverse-transcription PCR (Q-PCR) analysis. The microsomal fraction was also obtained from the cells. Control and the UGT1A1-induced HepG2 cells were further treated with trovafloxacin (50 µM) for 24 h.
cDNA was synthesized from total RNA using ReverTra Ace qPCR RT Master Mix (Toyobo, Tokyo, Japan) according to the manufacturer’s protocol. Q-PCR was performed with THUNDERBIRD SYBR qPCR Mix (Toyobo), and the reactions were run in a CFX96 Real-Time PCR Detection System (Bio-Rad, Hercules, CA, U.S.A.). Expression of glyceraldehyde 3-phosphate dehydrogenase (GAPDH) mRNA was used as an internal control for the cDNA quantity and quality. Primer pairs that can detect UGT1A1 and GAPDH were reported previously.20,21) Other primers used were newly established with a program, Primer Blast (National Institutes of Health). We confirmed that all of the primer sets produced specific bands and that bands were not detected when the PCR reaction was conducted without cDNA. After an initial denaturation at 95°C for 30 s, the amplification was performed by denaturation at 95°C for 5 s, annealing at an appropriate temperature for 30 s, and extension at 72°C for 30 s for 45 cycles. HepG2 cells were treated with 100 µM estradiol. Seven hours after incubation at 37°C, a portion of the cell-culturing media was collected and mixed with the same amount of acetonitrile. After removal of proteins by centrifugation at 12000×g for 5 min, supernatant was subjected to HPLC. HepG2 cells were seeded into 96-well plates at 1×104 cells/well and were maintained at 37°C for 24 h. Forty-eight hours after changing the culture medium to a normal or a chrysin-containing DMEM medium, the cells were co-treated with trovafloxacin (50 µM) and TNF-α (4 ng/mL) for 24 h. Cell viability was measured using a 3-(4,5-dimethylthiazol-2-yl)-2,5-diphenyltetrazolium bromide (MTT) Cell Counting Kit (Nacalai Tesque, Kyoto, Japan) according to the manufacturer’s protocol. Heterozygous Ugt1 (Ugt1+/−) mice23) and C57BL/6NCrSlc mice were used to obtain wild type (Ugt1+/+), Ugt1+/−, and UGT1 knockout (Ugt1−/−) mice. Genomic DNA was isolated from tail biopsies and was used as a template for genotyping PCR.24) All animals received food and water ad libitum, and mouse handling and experimental procedures were conducted in accordance with our animal care protocol, which was previously approved by Kitasato University. Two-day-old mice were subcutaneously treated with trovafloxacin (150 mg/kg) or canola oil. Three hours after the injections, mice were subcutaneously treated with lipopolysaccharide (LPS) (5 mg/kg) or saline. Nine hours after the second treatment, blood was obtained from the submandibular vein and serum was prepared. Serum alanine aminotransferase (ALT) levels were determined using a Transaminase CII-test Wako kit (Wako Pure Chemical Industries, Ltd.) according to the manufacturer’s protocol. Significant differences of UGT1A1 expression in HepG2 cells were analyzed by Dunnett’s test. The Tukey–Kramer test was used to determine the significance in the gene expression studies. The unpaired t-test was used to determine the significance in the enzyme and cell viability assays. p<0.05 was considered as significant. Chrysin, phenytoin, carbamazepine, and phenobarbital can induce UGT1A1 in vitro and in vivo.25–27) To determine the most potent UGT1A1 inducer in HepG2 cells, we preliminarily conducted a cell-based induction assay.28) HepG2 cells were treated with a lower (10 µM) and a higher (50 µM) concentration of chrysin, phenytoin, carbamazepine, and phenobarbital. Forty-eight hours after the treatment, RNA was isolated and a Q-PCR analysis was carried out to determine the UGT1A1 expression level in the cells. We observed that phenytoin, carbamazepine, and phenobarbital moderately induced UGT1A1 in HepG2 cells. In contrast, it was demonstrated that chrysin significantly induced UGT1A1. In a subsequently performed study, chrysin concentration-dependently induced the UGT1A1 mRNA expression in HepG2 cells (Fig. 1A). The highest expression of UGT1A1 was observed when the cells were treated with 50-µM chrysin. When HepG2 cells were treated with even higher concentrations of chrysin such as 80 and 100 µM, slight and moderate cytotoxicity was induced, respectively. It was further demonstrated that the microsomes prepared from the HepG2 cells treated with 50-µM chrysin exhibited an 8-fold higher estradiol 3-O-glucuronidation activity (Fig. 1B). The estradiol 3-O-glucuronidations in the cells were also determined in the absence of additional UDPGA. Estradiol was added into the cell-culturing media and was incubated for 7 h. Estradiol 3-O-glucuronide was detected in the cell-culturing medium of HepG2 cells. The amount of glucuronide was three-fold greater in the medium of the UGT1A1-induced HepG2 cells (Fig. 1C). Trovafloxacin acyl-glucuronide was not detected in the reaction mixture including the microsomes prepared from the control HepG2 cells. Meanwhile, a slight but detectable amount of trovafloxacin acyl-glucuronide was observed in the reaction mixture including the microsomes prepared from the UGT1A1-induced HepG2 cells with 1.1 pmol/min/mg (Fig. 1D). Estradiol is a selective substrate of UGT1A129); therefore, it was demonstrated that the HepG2 cells treated with 50-µM chrysin was the UGT1A1-induced cell model. (A) HepG2 cells were treated with chrysin (20–100 µM) for 48 h. Total RNA was isolated from the cells and the UGT1A1 mRNA expression was determined by Q-PCR. (B) HepG2 cells were treated with chrysin (50 µM) for 48 h. Microsomes were prepared and the UGT1A1 activity was determined using the UGT1A1 specific substrate, estradiol. (C) Estradiol was added to the cell-culturing media and the amount of estradiol 3-O-glucuronide was determined. (D) Trovafloxacin acyl-glucuronidation was determined in microsomes prepared from HepG2 cells. Data are the mean±S.D. (n=5). N.D., not detected. * p<0.05 compared to control. It has been shown that TOP1, BCLAF MFN1, MT2A, MT1H, and MT1X were significantly induced in the liver when hepatocytes and animals were treated with trovafloxacin.13) To investigate whether these trovafloxacin-associated genes are induced by trovafloxacin acyl-glucuronide or not, the mRNA expression of the genes was quantified in the HepG2 cells and the cells treated with trovafloxacin in the presence or absence of chrysin. It was confirmed that chrysin highly induced UGT1A1 in the HepG2 cells, while trovafloxacin itself did not induce UGT1A1 (Fig. 2A). MT2A, TOP1, and BCLAF were induced 2- to 3-fold by trovafloxacin (Fig. 2B), which was in agreement with the previous reports.13) In the UGT1A1-induced cells, however, the expression level of MT2A, TOP1, and BCLAF was still 2- to 3-fold higher in the presence of trovafloxacin compared to the level in the control cells. Increased amount of UGT1A1 in the HepG2 cells did not affect the expression of MT2A, TOP1, and BCLAF mRNA, suggesting that trovafloxacin acyl-glucuronide was not involved in the induction of these genes. 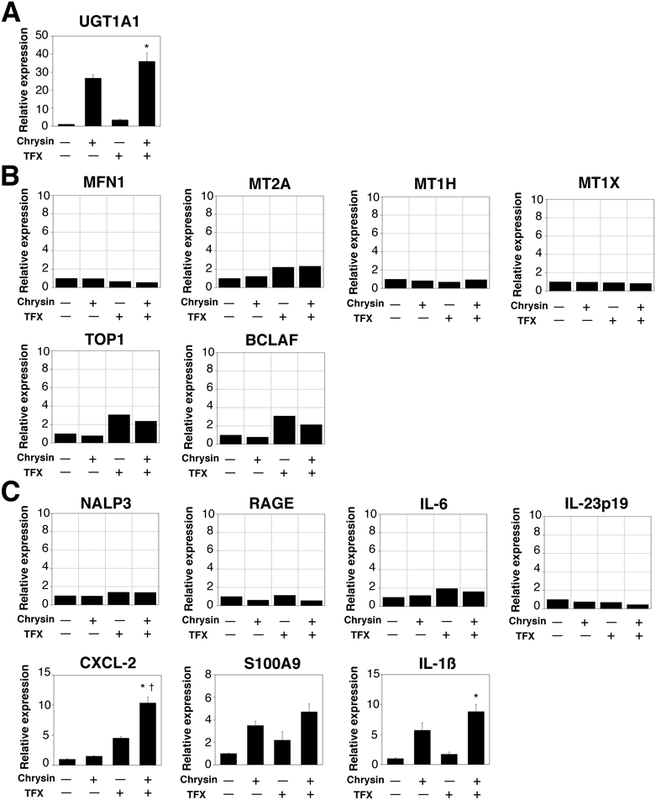 The expression levels of MFN1, MT1H, and MT1X were also examined in the control and UGT1A1-induced HepG2 cells; however, none of these genes were specifically induced by trovafloxacin in the UGT1A1-induced HepG2 cells (Fig. 2B). UGT1A1-induced HepG2 cells were developed by treating the cells with chrysin (50 µM) for 48 h. Control and the UGT1A1-induced HepG2 cells were further treated with trovafloxacin (50 µM) for 24 h. Total RNA was isolated from the cells and the mRNA expression of UGT1A1 was determined (A). The mRNA expressions of MFN1, MT2A, MT1H, MT1X, TOP1, and BCLAF, which are reported trovafloxacin-induced toxicity-associated gene, were determined by Q-PCR (B). The mRNA expressions of NALP3, RAGE, IL-6, and IL-23p19, which are reported DILI-associated gene, were determined by Q-PCR (C). The mRNA expressions of NALP3, RAGE, IL-6, and IL-23p19, which are reported DILI-associated gene, were determined by Q-PCR (C). The mRNA expressions of CXCL-2, S100A9, and IL-1β, which are immunotoxicity-associated genes, were determined by Q-PCR (D). Data are the mean of two independent experiments (B and C) or the mean±S.D. of three independent experiments (A and D). TFX, Trovafloxacin. * p<0.05 compared to the level in HepG2 cells treated with TFX. † p<0.05 compared to the level in HepG2 cells treated with chrysin. It has been demonstrated that neuronal apoptosis inhibitory protein, MHC class II, HET-E, telomerase protein 1 domain-, leucine-rich repeat-, and pyrin domain-containing protein 3 (NALP3), receptor for advanced glycation endproducts (RAGE), interleukin (IL)-6, and IL-23p19 were highly induced by drugs that were associated with drug-induced liver injury (DILI) in the cell-based assay.30) In HepG2 cells, IL-6 was induced 2-fold when HepG2 cells were treated with trovafloxacin (Fig. 2C). Meanwhile, trovafloxacin did not induce NALP3, RAGE, or IL-23p19 in HepG2 cells. In the UGT1A1-induced model, such induction pattern was still the same as observed in the control HepG2 cells. Chemokine (C-X-C motif) ligand 2 (CXCL-2), S100A9, and IL-1β are also genes associated with DILI.30,31) To further determine whether these genes are specifically responsive to trovafloxacin acyl-glucuronide, the expression levels of CXCL-2, S100A9, and IL-1β were examined in the control and UGT1A1-induced HepG2 cells. CXCL-2 was induced 4-fold by the treatment of trovafloxacin in the HepG2 cells (Fig. 2D). In the UGT1A1-induced cells, trovafloxacin induced CXCL-2 more than 10-fold compared to the level in the control cells. S100A9 was not induced by trovafloxacin; however, this gene was highly induced by chrysin (Fig. 2D). IL-1β was similarly induced by chrysin in HepG2 cells in the presence or absence of trovafloxacin (Fig. 2D). CXCL-2 was uniquely induced by trovafloxacin in the UGT1A1-induced HepG2 cells, indicating that CXCL-2 might be specifically induced by trovafloxacin acyl-glucuronide. The effect of the UGT1A1 induction on cell viability was examined by an MTT assay. Co-treatment of control HepG2 cells with trovafloxacin and TNF-α decreased the cell viability by 50% (Fig. 3A, left column). When UGT1A1-induced HepG2 cells were used, the co-treatment decreased the cell viability by 65% (Fig. 3A, right column). To further investigate the importance of UGT1A1 in the trovafloxacin-induced liver toxicity in vivo, we utilized Ugt1-knockout mice. It was previously shown that Ugt1 knockout mice display no UGT1 activities, while wild type and heterozygous Ugt1 mice similarly have higher glucuronidation activities.23) When wild type and heterozygous Ugt1 mice were treated with trovafloxacin as well as LPS, serum ALT levels were increased 5-fold. In contrast, such increase was not observed in the Ugt1 knockout mice (Fig. 3B). Although it was not statistically significant, these data indicate that UGT1A1 might be involved in the trovafloxacin-induced hepatotoxicity in vitro and in vivo. (A) HepG2 cells were co-treated with trovafloxacin (TFX) and TNF-α in the presence or absence of chrysin. (B) Wild type (WT), Ugt1+/− (Hetero), and Ugt1−/− (KO) mice were co-treated with TFX and LPS. Nine hours after the treatment, serum ALT levels were determined. Data are the mean±S.D. (n>3). * p<0.05 compared to control. DILI is one of the leading causes of acute liver failure in the U.S.A. While trovafloxacin was withdrawn from the market due to the high risk of developing the severe liver damage, the molecular mechanism underlying the trovafloxacin-induced hepatotoxicity remains to be cleared. Importantly, whether the reactive metabolite—trovafloxacin acyl-glucuronide—is involved in the toxic reaction or not has been inconclusive. Various cell-based assays have been developed to evaluate the cyto- and genotoxicity of compounds.12) An addition of liver microsomes or drug-metabolizing enzyme-expressing systems, as well as the substrates, into the cell-culturing medium is a convenient method to generate reactive metabolites in the cell-culturing medium. In fact, this method can be used to determine the hepatotoxic potential of compounds in preclinical drug development.30) Since most of drug-metabolizing enzymes are localized in the endoplasmic reticulum membrane, extremely hydrophilic metabolites such as glucuronides are usually produced inside the cells. Meanwhile, such metabolites would be generated outside of the plasma membrane if liver microsomes and enzyme-expressing systems were experimentally added into the medium. To properly evaluate the effect of trovafloxacin acyl-glucuronide on the hepatic cells, in the present study, we developed UGT1A1-induced HepG2 cells. Due to the detection limit of the instruments used, we were not able to determine the formation of trovafloxacin acyl-glucuronide in the cells. However, the microsomes prepared from the UGT1A1-induced HepG2 cells exhibited higher estradiol 3-O- and trovafloxacin acyl-glucuronidation activities (Figs. 1B, D), indicating that a higher amount of trovafloxacin acyl-glucuronide should have been produced in the UGT1A1-induced cells. A previous study reported that trovafloxacin was mainly metabolized to its glucuronide in humans, while it is partially metabolized to N-acetyltrovafloxacin and sulfate conjugate.8) Therefore, it was considered that the effect of other trovafloxacin-metabolizing enzymes and their metabolites on the trovafloxacin-induced cytotoxicity was minor. Thus, it is assumed that the 10-fold induction of CXCL-2 (Fig. 2D) was specifically caused by trovafloxacin acyl-glucuronide. In vitro MTT assays and in vivo studies with Ugt1 knockout mice also indicated that UGT1A1 was highly involved in the trovafloxacin-induced hepatotoxicity (Fig. 3). C-X-C Motif chemokine receptor 2 (CXCR2) is a receptor of CXCL-2. It was previously demonstrated that ischemia–reperfusion caused significant liver injury in wild type mice, but not in CXCR2-deficient mice.32) Moreover, it was demonstrated that a treatment of primary hepatocytes with recombinant CXCL-2 induced lactate dehydrogenase (LDH) release in the cells.32) Induction of CXCL-2 was also observed in mice treated with hepatotoxic α-naphthylisothiocyanate, carbon tetrachloride, and acetaminophen.33–35) Previously, it was indicated that certain types of cells and cytokines, such as Th17 cells and TNF-α, are commonly involved in various drug-induced hepatotoxicity.36) Therefore, CXCL-2 can also be specifically induced by certain toxicants and its induction might play a significant role in the development of liver injury. The detailed mechanism underlying the induction of CXCL-2 by trovafloxacin acyl-glucuronide needs to be elucidated in the future. Since Toll like receptor 2 (TLR2) is tightly associated with the development of liver injury as well as the gene expression of hepatic CXCL-2,34,37) TLR2 might be the key factor in trovafloxacin acyl-glucuronide-associated liver injury. In conclusion, we treated HepG2 cells with chrysin, a known UGT inducer,38,39) to induce UGT1A1. CXCL-2, a cytokine involved in DILI, was uniquely induced by trovafloxacin in the UGT1A1-induced HepG2 cells. In vitro and in vivo studies further demonstrated the importance of UGT1A1 in the trovafloxacin-induced liver toxicity. Although the complete mechanism of trovafloxacin-induced liver injury is still unknown, trovafloxacin acyl-glucuronide can be involved in the development of toxic reactions in vitro and in vivo. Interindividual variability in the UGT1A1 activity as well as protein–protein interactions involving UGT40,41) might be associated with the idiosyncrasy of trovafloxacin-induced liver injury in humans. 1) Dutton GJ. Acceptor substrates of UDP glucuronosyltransferase and their assay, in Glucuronidation of Drugs and Other Compounds (Dutton GJ ed). pp. 69–78, CRC Press, Boca Raton, FL (1980). 2) Mackenzie PI, Bock KW, Burchell B, Guillemette C, Ikushiro SI, Iyanagi T, Miners JO, Owens IS, Nebert DW. Nomenclature update for the mammalian UDP glycosyltransferase (UGT) gene superfamily. Pharmacogenet. Genomics, 15, 677–685 (2005). 3) Ritter JK, Chen F, Sheen YY, Tran HM, Kimura S, Yeatman MT, Owens IS. A novel complex locus UGT1 encodes human bilirubin, phenol, and other UDP–glucuronosyltransferase isozymes with identical carboxyl termini. J. Biol. Chem., 267, 3257–3261 (1992). 4) Tukey RH, Strassburg CP. Human UDP–glucuronosyltransferases: metabolism, expression, and disease. Annu. Rev. Pharmacol. Toxicol., 40, 581–616 (2000). 5) Fujiwara R, Maruo Y, Chen S, Tukey RH. Role of extrahepatic UDP–glucuronosyltransferase 1A1: Advances in understanding breast milk-induced neonatal hyperbilirubinemia. Toxicol. Appl. Pharmacol., 289, 124–132 (2015). 6) Kaminsky LS, Zhang QY. The small intestine as a xenobiotic-metabolizing organ. Drug Metab. Dispos., 31, 1520–1525 (2003). 7) Gootz TD, McGuirk PR. New quinolones in development. Expert Opin. Investig. Drugs, 3, 93–114 (1994). 8) Dalvie DK, Khosla N, Vincent J. Excretion and metabolism of trovafloxacin in humans. Drug Metab. Dispos., 25, 423–427 (1997). 9) Pumford NR, Myers TG, Davila JC, Highet RJ, Pohl LR. Immunochemical detection of liver protein adducts of the nonsteroidal antiinflammatory drug diclofenac. Chem. Res. Toxicol., 6, 147–150 (1993). 10) Kutsuno Y, Itoh T, Tukey RH, Fujiwara R. Glucuronidation of drugs and druginduced toxicity in humanized UDP–glucuronosyltransferase 1 mice. Drug Metab. Dispos., 42, 1146–1152 (2014). 11) Miyashita T, Kimura K, Fukami T, Nakajima M, Yokoi T. Evaluation and mechanistic analysis of the cytotoxicity of the acyl glucuronide of nonsteroidal anti-inflammatory drugs. Drug Metab. Dispos., 42, 1–8 (2014). 12) Koga T, Fujiwara R, Nakajima M, Yokoi T. Toxicological evaluation of acyl glucuronides of nonsteroidal anti-inflammatory drugs using human embryonic kidney 293 cells stably expressing human UDP–glucuronosyltransferase and human hepatocytes. Drug Metab. Dispos., 39, 54–60 (2011). 13) Liguori MJ, Blomme EA, Waring JF. Trovafloxacin-induced gene expression changes in liver-derived in vitro systems: comparison of primary human hepatocytes to HepG2 cells. Drug Metab. Dispos., 36, 223–233 (2008). 14) Liguori MJ, Anderson MG, Bukofzer S, McKim J, Pregenzer JF, Retief J, Spear BB, Waring JF. Microarray analysis in human hepatocytes suggests a mechanism for hepatotoxicity induced by trovafloxacin. Hepatology, 41, 177–186 (2005). 15) Waring JF, Liguori MJ, Luyendyk JP, Maddox JF, Ganey PE, Stachlewitz RF, North C, Blomme EA, Roth RA. Microarray analysis of lipopolysaccharide potentiation of trovafloxacin-induced liver injury in rats suggests a role for proinflammatory chemokines and neutrophils. J. Pharmacol. Exp. Ther., 316, 1080–1087 (2006). 16) Lubasch A, Keller I, Borner K, Koeppe P, Lode H. Comparative pharmacokinetics of ciprofloxacin, gatifloxacin, grepafloxacin, levofloxacin, trovafloxacin, and moxifloxacin after single oral administration in healthy volunteers. Antimicrob. Agents Chemother., 44, 2600–2603 (2000). 17) Vincent J, Venitz J, Teng R, Baris BA, Willavize SA, Polzer RJ, Friedman HL. Pharmacokinetics and safety of trovafloxacin in healthy male volunteers following administration of single intravenous doses of the prodrug, alatrofloxacin. J. Antimicrob. Chemother., 39 (Suppl. 2), 75–80 (1997). 18) Olsen KM, Rebuck JA, Weidenbach T, Fish DN. Pharmacokinetics of intravenous trovafloxacin in critically ill adults. Pharmacotherapy, 20, 400–404 (2000). 19) Fujiwara R, Sumida K, Kutsuno Y, Sakamoto M, Itoh T. UDP–glucuronosyltransferase (UGT) 1A1 mainly contributes to the glucuronidation of trovafloxacin. Drug Metab. Pharmacokinet., 30, 82–88 (2015). 20) Kutsuno Y, Hirashima R, Sakamoto M, Ushikubo H, Michimae H, Itoh T, Tukey RH, Fujiwara R. Expression of UDP–glucuronosyltransferase 1 (UGT1) and glucuronidation activity toward endogenous substances in humanized UGT1 mouse brain. Drug Metab. Dispos., 43, 1071–1076 (2015). 21) Fujiwara R, Takenaka S, Hashimoto M, Narawa T, Itoh T. Expression of human solute carrier family transporters in skin: possible contributor to drug-induced skin disorders. Sci. Rep., 4, 5251 (2014). 22) Sumida K, Kawana M, Kouno E, Itoh T, Takano S, Narawa T, Tukey RH, Fujiwara R. Importance of UDP–glucuronosyltransferase 1A1 expression in skin and its induction by UVB in neonatal hyperbilirubinemia. Mol. Pharmacol., 84, 679–686 (2013). 23) Nguyen N, Bonzo JA, Chen S, Chouinard S, Kelner MJ, Hardiman G, Bélanger A, Tukey RH. Disruption of the ugt1 locus in mice resembles human Crigler–Najjar type I disease. J. Biol. Chem., 283, 7901–7911 (2008). 24) Fujiwara R, Nguyen N, Chen S, Tukey RH. Developmental hyperbilirubinemia and CNS toxicity in mice humanized with the UDP glucuronosyltransferase 1 (UGT1) locus. Proc. Natl. Acad. Sci. U.S.A., 107, 5024–5029 (2010). 25) Aoshima N, Fujie Y, Itoh T, Tukey RH, Fujiwara R. Glucose induces intestinal human UDP–glucuronosyltransferase (UGT) 1A1 to prevent neonatal hyperbilirubinemia. Sci. Rep., 4, 6343 (2014). 26) Soars MG, Petullo DM, Eckstein JA, Kasper SC, Wrighton SA. An assessment of UDP–glucuronosyltransferase induction using primary human hepatocytes. Drug Metab. Dispos., 32, 140–148 (2004). 27) Ritter JK, Kessler FK, Thompson MT, Grove AD, Auyeung DJ, Fisher RA. Expression and inducibility of the human bilirubin UDP–glucuronosyltransferase UGT1A1 in liver and cultured primary hepatocytes: Evidence for both genetic and environmental influences. Hepatology, 30, 476–484 (1999). 28) Westerink WM, Schoonen WG. Phase II enzyme levels in HepG2 cells and cryopreserved primary human hepatocytes and their induction in HepG2 cells. Toxicol. In Vitro, 21, 1592–1602 (2007). 29) Miners JO, Mackenzie PI, Knights KM. The prediction of drug-glucuronidation parameters in humans: UDP–glucuronosyltransferase enzyme-selective substrate and inhibitor probes for reaction phenotyping and in vitro–in vivo extrapolation of drug clearance and drug–drug interaction potential. Drug Metab. Rev., 42, 196–208 (2010). 30) Yano A, Oda S, Fukami T, Nakajima M, Yokoi T. Development of a cell-based assay system considering drug metabolism and immune- and inflammatory-related factors for the risk assessment of drug-induced liver injury. Toxicol. Lett., 228, 13–24 (2014). 31) Toyoda Y, Miyashita T, Endo S, Tsuneyama K, Fukami T, Nakajima M, Yokoi T. Estradiol and progesterone modulate halothane-induced liver injury in mice. Toxicol. Lett., 204, 17–24 (2011). 32) Kuboki S, Shin T, Huber N, Eismann T, Galloway E, Schuster R, Blanchard J, Edwards MJ, Lentsch AB. Hepatocyte signaling through CXC chemokine receptor-2 is detrimental to liver recovery after ischemia/reperfusion in mice. Hepatology, 48, 1213–1223 (2008). 33) Xu J, Lee G, Wang H, Vierling JM, Maher JJ. Limited role for CXC chemokines in the pathogenesis of alpha-naphthylisothiocyanate-induced liver injury. Am. J. Physiol. Gastrointest. Liver Physiol., 287, G734–G741 (2004). 34) Moles A, Murphy L, Wilson CL, Chakraborty JB, Fox C, Park EJ, Mann J, Oakley F, Howarth R, Brain J, Masson S, Karin M, Seki E, Mann DAA. A TLR2/S100A9/CXCL-2 signaling network is necessary for neutrophil recruitment in acute and chronic liver injury in the mouse. J. Hepatol., 60, 782–791 (2014). 35) James LP, McCullough SS, Lamps LW, Hinson JA. Effect of N-acetylcysteine on acetaminophen toxicity in mice: relationship to reactive nitrogen and cytokine formation. Toxicol. Sci., 75, 458–467 (2003). 36) Yokoi T. New prospectives and understanding in drug-induced liver injury considering drug metabolism and immune- and inflammation-related factors. Folia Pharmacologica Japonica, 144, 22–27 (2014). 37) Shaw PJ, Ganey PE, Roth RA. Trovafloxacin enhances the inflammatory response to a Gram-negative or a Gram-positive bacterial stimulus, resulting in neutrophil-dependent liver injury in mice. J. Pharmacol. Exp. Ther., 330, 72–78 (2009). 38) Bonzo JA, Bélanger A, Tukey RH. The role of chrysin and the ah receptor in induction of the human UGT1A1 gene in vitro and in transgenic UGT1 mice. Hepatology, 45, 349–360 (2007). 39) Smith CM, Graham RA, Krol WL, Silver IS, Negishi M, Wang H, Lecluyse EL. Differential UGT1A1 induction by chrysin in primary human hepatocytes and HepG2 cells. J. Pharmacol. Exp. Ther., 315, 1256–1264 (2005). 40) Fujiwara R, Nakajima M, Oda S, Yamanaka H, Ikushiro S, Sakaki T, Yokoi T. Interactions between human UDP–glucuronosyltransferase (UGT) 2B7 and UGT1A enzymes. J. Pharm. Sci., 99, 442–454 (2010). 41) Fujiwara R, Itoh T. Extensive protein–protein interactions involving UDP–glucuronosyltransferase (UGT) 2B7 in human liver microsomes. Drug Metab. Pharmacokinet., 29, 259–265 (2014).